We make homemade turkey burgers and sweet potato fries when we crave something like fast food! I couldn’t agree more with the difference of feeding your body and mind healthy choices over processed “foods”. Thats great! I love some home made sweet potato fries when a hint of honey! Very good LJay. I call the current processed food Plastic food. I don’t think any part of it is real. The United States Spends $2.7 trillion annually on Health Care, and out of 187 countries we are ranked 29th in Male health and 33rd in Female health. The best country is Japan. Now remember what happened in Japan a few years ago. Didn’t it go radioactive, because of nuke plants? If they have that kind of health problem how can they be on top? IS IT SOMETHING THEY EAT?????? Read Dr. Mercola’s article. He goes on about waste of money but the point is WE ARE EATING FOOD THAT’S KILLING US. I like the analogy! “Plastic food” haha but its true. From what I know about the Japanese is that they consume adequate amounts of fish oil directly from fish, noodles are made of whole wheat, and they eat many soy based foods like tofu, soybeans and soysauce which is also good for heart health. Japanese people are also very active. Their norms praise enlightenment and they believe that the body is a temple and you should take care of that temple. US norms are so much different than theirs. I can honestly see why they are number 1 in the highest life expectancy despite the few explosions of the nuclear power planst. Mercola’s makes an interesting point and its true that so much money as he quoted “2.7 trillion” is being spent on health care. I know of some people who have been told by their doctor to cut out certain foods primarily sweets because they are pre diabetic. However they constantly eat highly refined sugars going against the doctor’s order. And the end result is that the medical insurance will have to pay whenever they go in for a check up and are prescribed more medication. Good observations and information. Yes this game played with medical insurance is crazy but the importance is DM is destroying your body making you dependent on the medical system for ever. The medication does not stop or fix anything. Your body just slowly decays and so does your brain. The Doctor is not going to go out of his way to suggest a better diet. He gets paid the more pills and test you have the better it is for him. He will be perfectly happy to watch you degrade and become totally dependent on him and the system. He just repeats as did mine. “LOOSE WEIGHT” Yet everything I ate converted to sugar including the Sugar-Free stuff. Thanks for reading and thinking about this. It is good to have your input. Hi L-Jay and happy new year!! Thanks for the post. I hope this will be a better year for me. I’,m thinking positive anyway 🙂 Have a great day. Hi Carolyn! Happy New Year to you as well! This will be a great year for you as long as you keep thinking positive and setting goals for yourself. This sense of accomplishment once you hit that goal is a great feeling! This is your year, I know it! Very, Makes you think about what you are really eating. I love this post! I am trying to figure out which foods make me feel and look good, inside and out. I myself have struggled with bad skin, so I’m excited to cut out many processed foods and consume as many natural foods as possible and see the results this has on my skin. Thats great! Keep it up and you will notice a difference. I try to eat leafy green veggies (broccoli, spinach, celery, cucumber, bell pepper etc) Also berries like strawberries, blackberries, cranberries etc. They are great for providing the body with antioxidants and good in vitamin C and E which helps improve the skin. Good luck to you and let me know how it goes! WOOWWW This is nuts! Legit it is so crazy when you put this stuff into perspective. Makes you wonder how people could ever eat that garbage. Great post! Exactly! Thanks alot! I think it all bowls down to people not knowing and even not caring. It starts with education and then application. Exactly! Knowledge is power! Keep up the great posts! Oh man! That’s gross, I need to bookmark this post and look at it every time I get a craving for fast food! As always you hit the nail on the head again… burgers that we get at fast food places are made to last…forever! Who knows when it was made, but you can be sure that it sat in a deep freezer for a long time! Bottom line, if God didnt make it we probably should not eat it!! Thanks alot Jinny! Youre right, and looking back at how our ancestors ate before processed foods and the fast food boom. They pretty much consumed nothing but all natural foods from the earth, and lived a good and healthy life. There is no truer statement than, “You are what you eat.” Garbage in, garbage out. I love to eat, ask my kids. One of my daughter’s pet names for me is Fatty, though it’s because I always seem to be eating, not because I’m fat. But I’m also an organic gardener and eat a lot of veggies, fruit, nuts and meat. Since I was diagnosed with celiac, I eat less baked good and drink less beer, which are two real calorie hogs. I tend to go by the way I feel rather than the scale, and I feel much better when I eat healthy than when I eat junk. So, yes, you are what you eat. Eat foods that remember where they came from, foods that you can easily identify. Lots of whole foods like fruits, vegetables, grains, legumes, nuts, seeds…all go a long way in growing health and wellness because their components are readily recognized, assimilated and utilized by our bodies! Great thought-starter! I’m very big on fruits and vegetables! Does a body good!! Thanks for sharing as always!! Very interesting photos, and scary. I’ve noticed my skin isn’t as dry as it used to be. I used to have to put lotion on my skin all the time to keep it from being so dry. This was very temporary lasting a couple hours. I eat better and drink more water and voila, I’m all good. It’s really too bad that the medical industry doesn’t tell people these things. I once asked a doctor for advice after he told me I should diet and exercise. I asked him what I should change in my diet and his response was “I don’t know”. There is a place for doctors but they’re trained to fix things with medicines, not by fixing the problems. I just wish I could better convince my friends that they’d be better off eating natural foods. That’s great Tim! You made a great change to your eating and now seeing the results. Yes, I wouldn’t be surprised that the doctor would not advise someone to eat better when the options for medal are available. Happens all the time. Keep up the good work Tim!! Oh, that photo speaks louder than a thousand words. It’s sad how much cheaper processed and unhealthy food is compared to healthy, organic foods. When it comes to skin care I totally agree that beauty needs to start on the inside, however, bad products filled with mineral oil can spoil the best of skin no matter you diet. I believe in being healthy inside out as well as outside in 🙂 Thank you for your post! I have noticed I can think more clearly and my emotions are more stable. People ask me how I can have so much willpower.But, once you are eating well, I don’t think it even really takes willpower. Why would I choose feeling like crap over feeling great? Plus, the food tastes better!! !I love hearing about others who are enjoying real food! Yay! I used to get really bad heartburn before making the switch. Now I rarely get it at all! Good post buddy! One thing that we have to understand is that our food supply and it’s management by the FDA and big corp[orations is THE biggest issue in our lives. There is so much wrong I cant even get started on it here but I will say one thing. People have to start looking at the GMO situation in this country because there is something very wrong. Other countries have banned GMO food so why hasn’t the USA?? HMMMMMM food for thought. Love your site dude good work! Thanks alot! I agree that the GMO issue has alot to do with many health issues. How can the body process and use fuel that is artificial. Interesting post brother as always! Always a pleasure reading your posts! Thanks alot! Glad you enjoyed. Most changes are very long-term and cumulative. However, adding a lot of salmon to your diet (more than once a week) and you notice an improvement in skin and less noticeable signs of aging almost immediately. You’ve been awarded the Versatile Blogger Award: http://ichalkit.wordpress.com/2013/01/09/the-versatile-blogger-award/. Congrats!!!!! I nominated you for a Liebster Blog Award http://chasingthetop.wordpress.com/2013/01/13/liebster-blog-award/ ! Pictures like this always freak me out. For the past four years I have been eating mostly natural foods but have plenty of friends who eat fast food and then complain about their weight. Your experience with your skin reminds me of a conversation we were having at work about western medecine. If someone is sick, here take a pill. If they’re injured, here use a cane (we were talking about the elderly). There is no focus on correcting the problem, just making it go away or pretending that the underlying issues can’t be bothered with. Thanks for that! There are a lot of issues that need to be corrected. We only get one life. Why not make the best out of it by living longer and stronger. 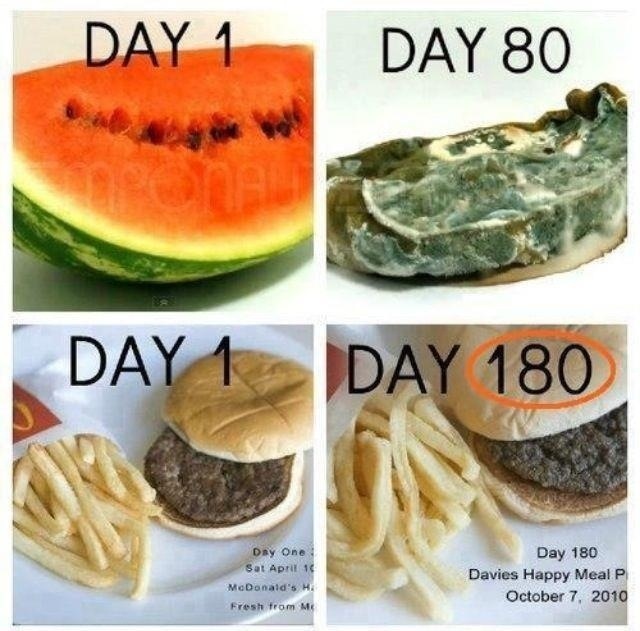 Oh these photos always make me sick but just reminds me to steer clear of processed “foods”. Thanks for sharing the photo and keeping me on the right side of the road. Oh wow thanks for sharing..never looked at it like that! eeeew! Wow! This is a fascinating post! Also, I’ve nominated you for the Very Inspirational Blogger Award! Love the More Natural Whole Foods blog. After watching Fat Sick and Nearly Dead I have been inspired to write a blog on something very similar. If you haven’t already watched it. I highly recommend it. Another great documentary is Hunger for Change. Both of these documentary’s break it down for even the person that has no clue about proper nutrition. Last thing. They are available on Netflix on the watch now section so you can watch from your computer on a Nexflix ready device. Thanks I am going to check it out!! Still waiting on that new post LJAY! 🙂 How about your training preparation for the upcoming racing season!? Ok sounds like a great topic. Ill get to working on it!! There you go! Can’t wait to read especially with the races we both have planned in the near future! This is an amazing comparison- more people need to see this.